Sweet, juicy and baked with berry goodness! A healthy and delicious dinner that is on the table in 30 minutes. Delicious dinner in a Dash! 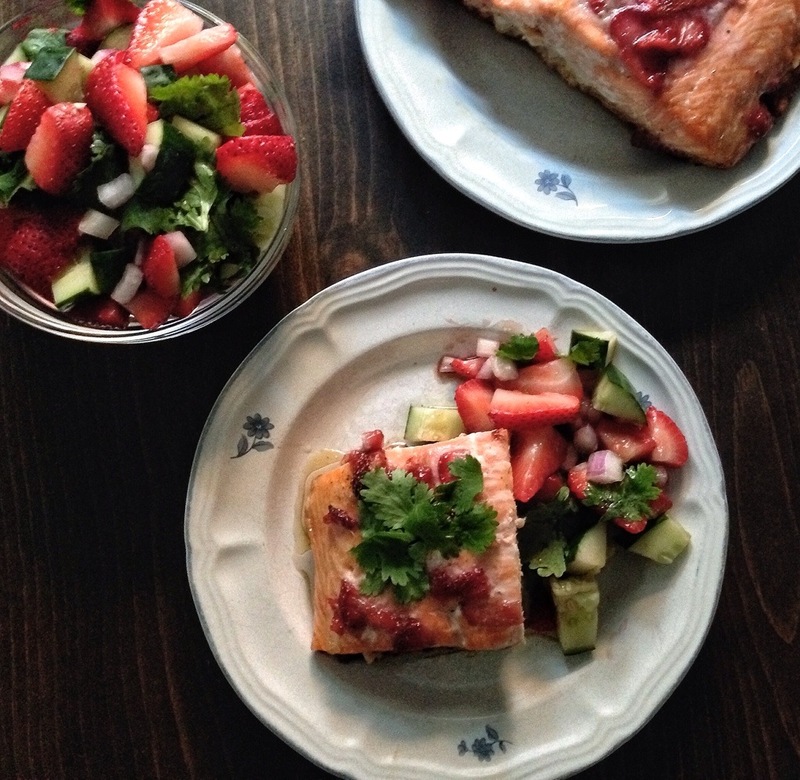 Are you ready for a strawberry treat that you can eat for dinner? 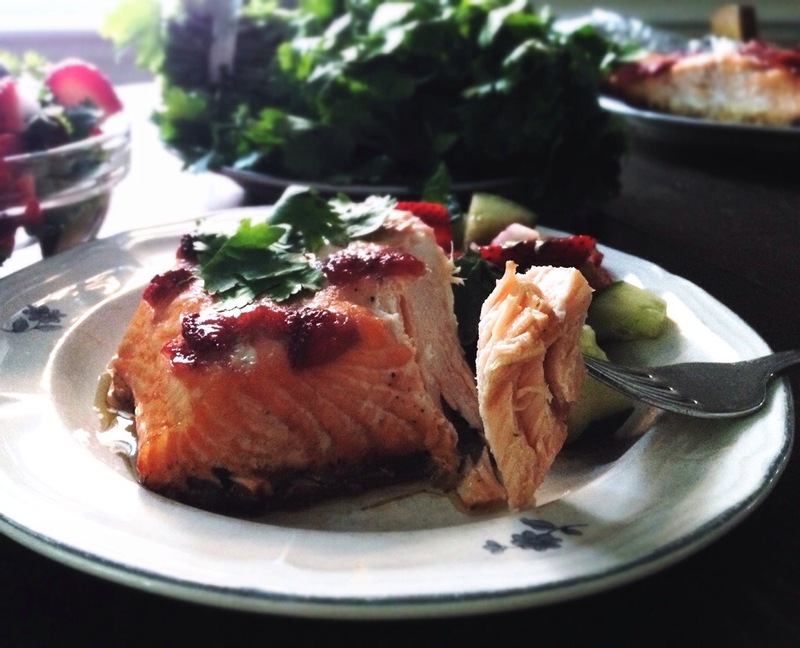 If you have eaten salmon before, you may have had maple-glazed salmon, orange-glazed salmon or honey-glazed salmon. 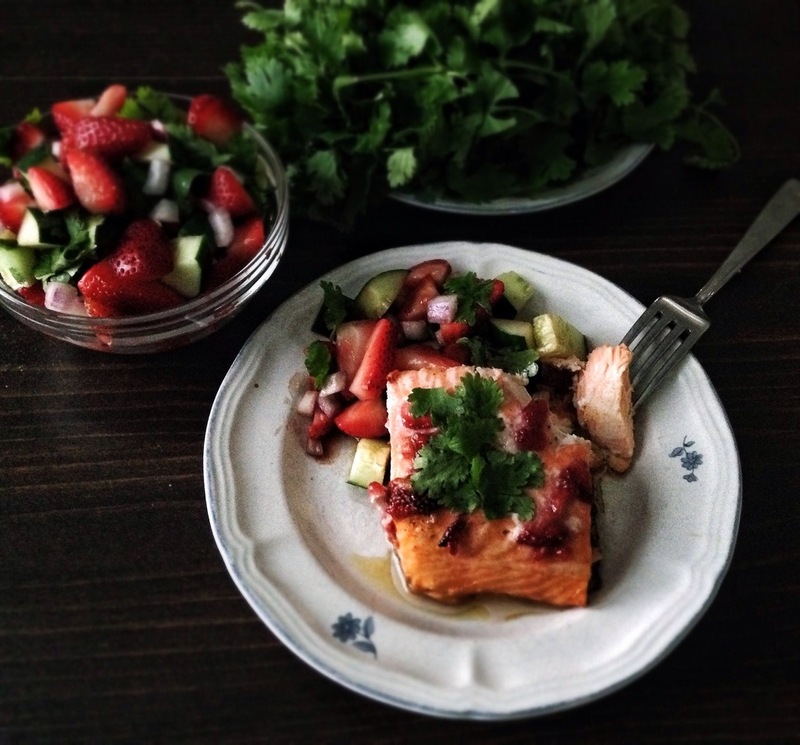 Allow me to introduce you to their sweet, juicy, slightly spicy, delicious and much better looking cousin, Strawberry-glazed salmon. This salmon is made with a quick homemade strawberry glaze that is studded with garlic, crushed red pepper flakes and a touch of salt. Bake at 400 for about 20 minutes (the cooking time may vary depending on how thick the salmon is) and enjoy! This summer has been packed with fun. I’ve been to two beautiful, fun weddings, vacationed with my family + adorable nieces and nephew on Cape Cod (Happy was there!) and moved in with my Taller-half! One thing I didn’t get to do this summer was go strawberry picking. 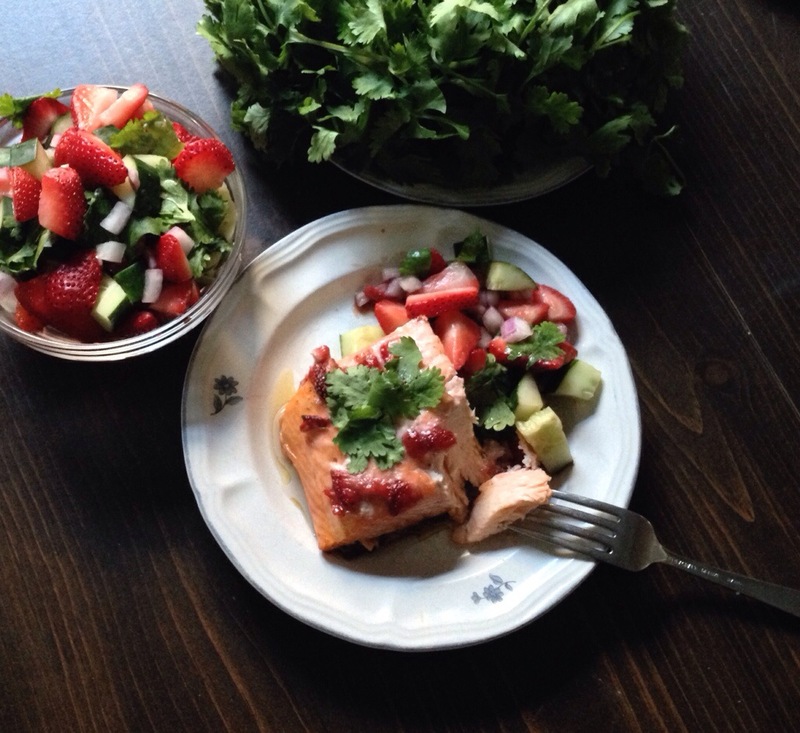 But I made up for it by buying strawberries by the 3lbs and made this strawberry-glazed salmon 3 TIMES in two weeks. Yeah, it’s that good. Did you miss all the strawberries this season? No worries, you can use frozen berries for this too! Never cooked fish before? This is the time to start! This recipe is perfect for beginners and can be enjoyed by all. This simple recipe starts by preparing the glaze. This glaze is easy and quick and makes all the difference! 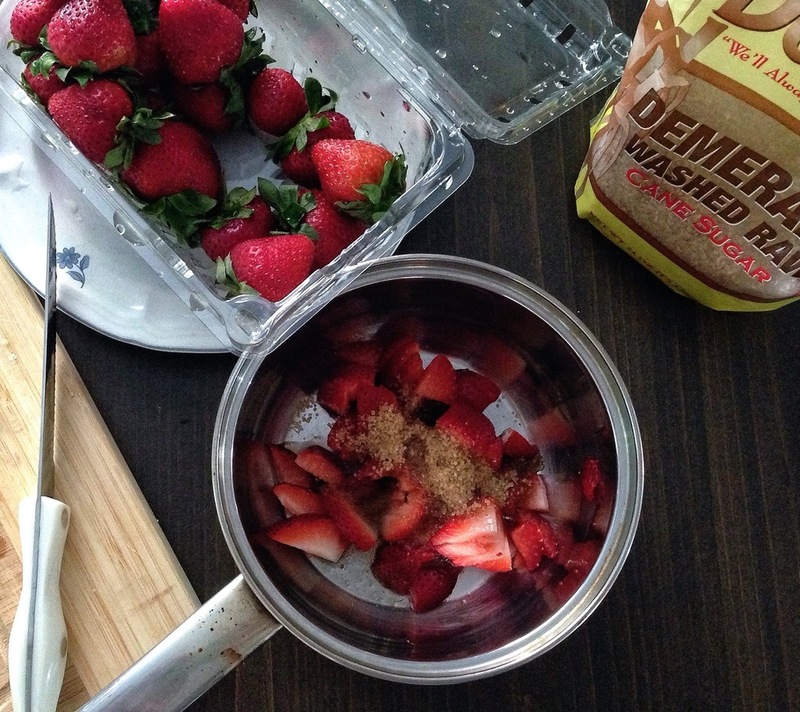 In a small saucepan, add sliced strawberries, water, sugar, garlic, salt and crushed red pepper flakes. Cook this on low heat for about 10 minutes, until all the sugar is dissolved. I used raw sugar, but you can use white sugar or even brown sugar. 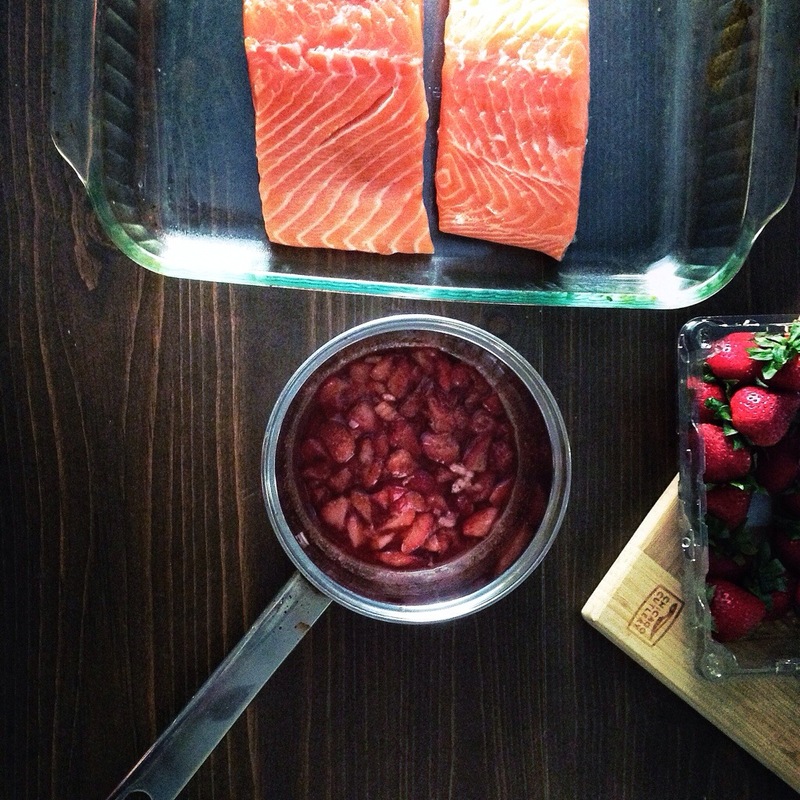 Place salmon in a baking dish and carefully pour the hot strawberry glaze over the salmon. Note: The baking dish I used below (9×13 inch) here is too big and the glaze will burn a bit – this can be avoided by adding a little water to the pan halfway through baking. Two pieces of salmon (~5-7oz each) fit nicely in a square 8×8 inch pan. Serve with a salad and enjoy! Strawberry goodness. Healthy and light. It’s the perfect end of summer meal. In a small saucepan, add the strawberries, sugar, water, garlic, salt and crushed red pepper flakes. Cook on low heat, stirring frequently until all the sugar is dissolved and the strawberries are soft, about 10 minutes. This mixture can burn easily, so be sure to keep an eye on it. Place salmon in prepared baking dish. Carefully add hot strawberry glaze over the salmon. 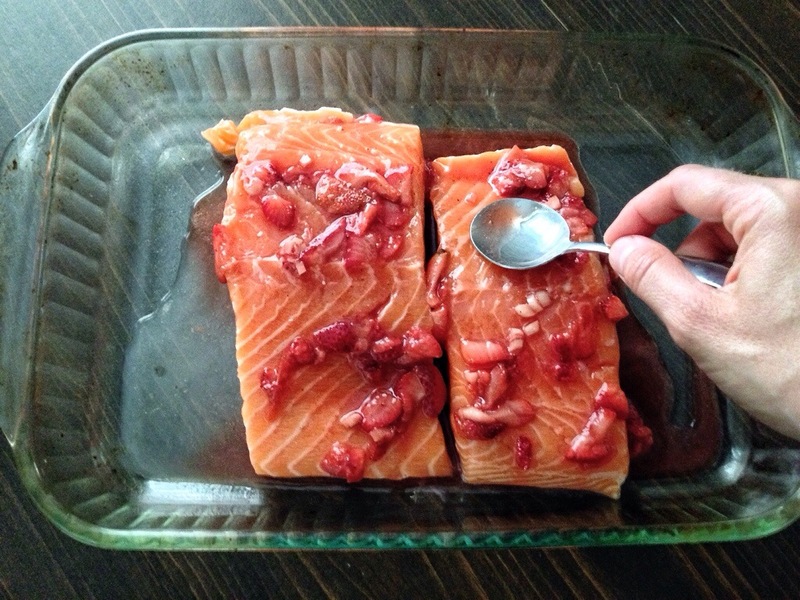 Using a spoon, gently spread and press the glaze on the salmon. Bake at 450 degrees F for 20 minutes** (time will depend on the size and thickness of the fillets) or until salmon is opaque throughout and flaky. You can also use a meat thermometer to measure the internal temperature of the thickest part of the fish. The temperature should be 140F or 60C. Serve the salmon warm. Salt and pepper the salmon, to taste. **About halfway through cooking, check on the fish. If the pan is too large, the glaze will burn. If this is happening, just add a little water to the dish, enough to make a very thin layer on the bottom. This will prevent burning and de-glaze the dish. *** The salmon can be served with more glaze on top. Just double the glaze recipe and upon serving, top with more warm glaze.